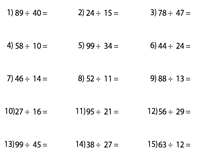 This compilation of division drills worksheets meticulously drafted for kids of grade 3 and grade 4 comprises a multitude of practice PDFs with skills such as dividing 2-digits by 1-digit, 2-digits by 2-digits, 3-digits by 1-digit and 3-digits by 2-digits with and without remainders. Each subtopic consists of minute drills with 15, 25 division problems and 50 division problems. The kids can be timed according to their ability. Bolster division skills with the step-by-step approach adopted in this set of worksheets featuring 25 division problems each with divisors ranging from 1 to 3, 1 to 6, 1 to 9, 1 to 10 and 1 to 12. 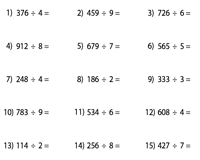 Divide 2-digit dividends by single-digit divisors and write the quotients of the division problems. Find 1-minute drills with 15 problems, 3-minute drills with 25 and 5-minute drills with 50 problems for more fun. 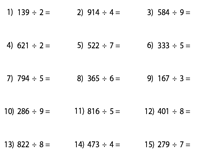 Introduce division involving remainders with 250+ problems employing this pack of 2-by-1 division worksheets for kids. 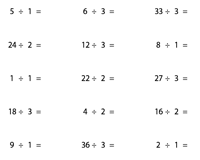 Solve the division equations with 2-digit dividends and divisors to figure out the quotient in each problem. Time kids with three batches of worksheets consisting of 15, 25 and 50 problems. Intensify your practice with double-digit numbers. Direct kids of grade 4 to find the solution to the division equations and write the remainders. Level up with the 3 digit dividends and single digit divisors offered in this bundle of division exercises. 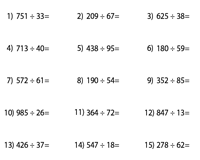 The numbers divide equally leaving no remainder. Divide the numbers and write the quotient and remainder to complete the minute drills. 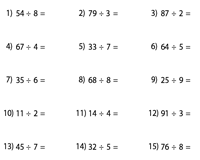 The kids are expected to complete a set of 15 division problems in 2 minutes, 25 in 4 minutes and 50 in 8 minutes. Reaffirm division skills with adequate practice exercises involving 3-digit dividends and 2-digit divisors with no leftovers. 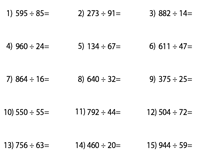 Divide the 3-digit numbers by double-digit divisors, write the quotient along with what is left over, in this stack of division worksheets.